FILE - The entrance of the International Criminal Court is seen in The Hague, March 3, 2011. The United States said Monday it would refuse to cooperate "in any way" with the International Criminal Court in The Hague if it carries out a prospective investigation into allegations of war crimes by U.S. military and intelligence personnel in Afghanistan. National Security Adviser John Bolton told the conservative Federalist Society in Washington that the court should not have jurisdiction over Americans or people from other nations that never ratified the treaty that created the court in 2002. At the same time, Bolton announced that the U.S. State Department is shutting down a Palestinian Liberation Organization office in Washington in response to Palestinian efforts to have the court prosecute Israeli actions and because the Palestinians have rejected direct negotiations with the Jewish state on a peace treaty. The Trump administration initially announced it would close the PLO office last year for its efforts to get the ICC to investigate Israel, but later reversed its decision. Palestinian President Mahmoud Abbas has asked the international court to investigate and prosecute Israeli officials for "their involvement in settlement activities and aggressions against our people." Palestinian official Saeb Erekat said the Trump administration move to close the office will not deter his government from going to the ICC. "The rights of the Palestinian people are not for sale, that we will not succumb to U.S. threats and bullying," he said Monday. Bolton called the ICC "fundamentally illegitimate" and an "assault on the constitutional rights of the United States." He said that it is not that the U.S. opposes holding war criminals accountable, but rather that they should "face charges by sovereign national governments" if crimes are alleged. Bolton said if the ICC carries out the investigation of U.S. military actions in Afghanistan, the U.S. would ban its judges and prosecutors from entering the country, freeze any funds they have in U.S. financial institutions, and attempt to prosecute them in U.S. courts. He said the ICC may soon formally announce an investigation of allegations of misconduct by members of the U.S. military and the Central Intelligence Agency, "American patriots," as Bolton called them. 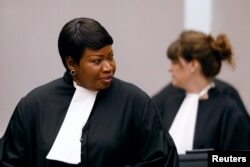 Last November, the ICC's chief prosecutor, Fatou Bensouda of Gambia, said the investigation would focus on "war crimes by members of the United States armed forces" and "secret detention facilities in Afghanistan" used by the CIA, particularly in 2003 and 2004. She said the Taliban and its affiliated Haqqani network, as well as the Afghan National Security Forces, would also be investigated. FILE - Public Prosecutor Fatou Bensouda attends a trial at the International Criminal Court in the Hague, the Netherlands, Aug. 28, 2018. Bensouda said her office "has determined that there are no substantial reasons to believe that the opening of an investigation would not serve the interests of justice, taking into account the gravity of the crimes and the interests of victims." Amnesty International official Adotei Akwei immediately rebuked the U.S. position, saying its rejection of the ICC's legitimacy "is an attack on millions of victims and survivors who have experienced the most serious crimes under international law and undermines decades of groundbreaking work by the international community to advance justice." Akwei said the U.S. should sign the Rome agreement creating the court and "support — not impede — its investigations. The ICC prosecutes the most serious crimes under international law — genocide, war crimes, crimes against humanity, and the crime of aggression. Resuming attacks against the court sends a dangerous signal that the United States is hostile to human rights and the rule of law." The ICC was designed to be permanent and independent of national governments as it investigated war crimes, crimes against humanity and genocide. But Bolton said the ICC has been "ineffective" and "unaccountable."